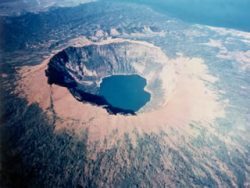 It is situated in the penisula with the same name the volcano Cosiguina has a lagoon inside the crater but reach it is very difficult. 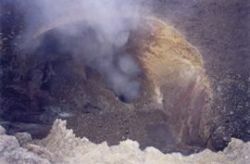 His last eruption was in 1835 and it is considered one of the most terrible of the Center America. 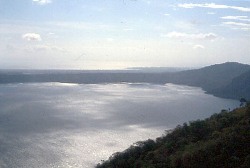 The lagoon of Apoyo is the biggest of Nicaragua, it is situated in the crater of a extinct volcano which have a diameter of 6 km and is situated in one of the more popolated zone of the country. The lagoon has a big variety of animals and plant and it preserves the originally forest. 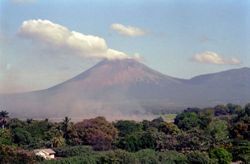 The San Cristobal is one of the volcanos that form the "Cinturon de Fuego" a chain that cross all the country. It isn't much turbolent but now some little activity started again. 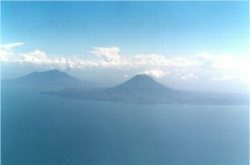 The island is composed by two volcanos: the biggest is the Madera and the smalles is the Conception; both the volcanos were adored by the natives and there are on the island museums whit objects of this period. The Masaya is one of the actives volcanos of Nicaragua, it is composed by two craters but only the Santiago is active; it emits gas and inside it you can admire the lava. It is near the city with the same name and there aren't the forest around it. 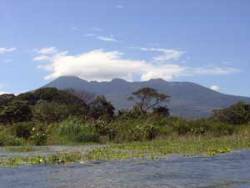 Thi volcano situated near the city of Granada is now extinct and the tropical forest has covered the the interior of the crater, it house a great number of animal and from his panoramic point you can see the lake Cocibolca.